My intention to post my first article about the 2009 Honda Indy last night was disrupted by a side effect of the warm, sunny Friday. Following a day of picture taking and information gathering, my unprotected areas of my arms and face are enveloped with a rather painful sunburn. As I'm now treating the result of not respecting the intense power of summer sunshine, I write about an otherwise nirvana-like experience at the return of auto racing to the streets of Toronto. More than just a Indy car race, this Toronto street race is a weekend festival to the smell of heated rubber and the sound of high-revving engines. Shutting down a portion of a busy Toronto roadways requires it to be nothing less. The 23rd running of the street race in Toronto, the race was a sorely missed event to the 2008 schedule to many Canadian racing fans after running continuously since 1986. Bringing the race back to Toronto as the Honda Indy is the first time that Indy Racing League sanctioning, Andretti Green stepped in to promote this year's race. With part of the promotion arm being seven-time past race winner at the Toronto street course, the gracious open wheel racing legend Michael Andretti has given Canadians a great victory. Promising to be a great race on Sunday afternoon, 23 cars are competing in what is the largest field in years. The biggest news being Paul Tracy's return to Toronto driving a KV Racing ride sponsored by Ontario Honda Dealers and supporting Wounded Warriors. Adding to the Canadian contingent is also Alex Tagliani driving for Conquest racing following several recent races off. As a final treat, reigning winner of the last Champ car sanctioned race Will Power has been given a third Penske car; this race will be Power's first event for Penske since the Indianapolis 500. Along with major IndyCar race on Sunday, excitement on the track is also provided by supporting racing series including the Firestone Indy Lights series, the ladder to IndyCar racing. 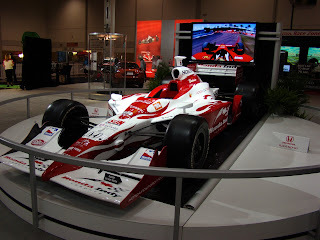 Within a predominately rookie field, Canadian and 6th place points driver James Hinchcliffe returns to the Toronto track with experience running the Toyota Atlantic race in 2006 and 2007. Added to the mix of racing talent on the track is the action of Canadian Touring Car Championship and vintage racing. Arriving for the first time as a member of the media, I was delighted when the Honda Indy rewarded me and All-Canadian Racing News with this opportunity to bring my special perspective of the event. Bring a auto racing fan longer than a journalist, I'm left unjaded to the sights of the greatest open-wheel drivers of the Indy car series and the pure sensation of 700 horsepower race cars operating as predators with speed being the prey. Of course, with yourselves being hearted motorsport fans, you can probably care less about my profusion for love of auto racing or even my suntan, for that matter. However, my duty is to feed your motorsport hunger with the richest palate of this great Toronto event. So please allow me to indulge your senses on the Friday running of the Honda Indy. As I entered the Direct Energy Center just before 9am I heard the songful whales of the Firestone Indy Lights series cars startng the day's on-track activities with their first practice. Formerly known as Infiniti engines, these smaller open wheel cars nonetheless provide a very spirited sound. Absent for a year based on complications of reunitifying the once bitterly opposite Champ Car and Indy Racing League, the track layout returned to its long-running configuration using Lake Shore and Princes Blvd as the primary streets. As the Indy Light cars run, I walk over a enclosed wooden pedestrian overtaking the track just before the final turn, feeling the sensation of the prospect IndyCar drivers' car passing was at first a jolting part of the morning. As Shefan Wilson set fastest lap in that section of practice, I walked over to the IndyCar series paddock as a morning practice for the top North America open wheel racing cars. Having been a fan for so long this is, disgustingly enough, my first time setting foot in the asphalt for the team paddock area. Seeing the morning preparation of the cars, the crew members are making their touches to the car before transporting their team's racing machines with small brick-shaped carts. Through the scrutinizing of IndyCar inspection, the race cars must also be filled with Ethanol from one of two tanker trucks before assembling in a lineup for their inaugural practice for the weekend race. 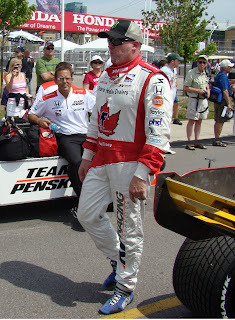 The first time I attended the than Molson Indy of Toronto in 1997, the paddock area was along the back of the pit lane. With the IndyCar paddock moved west towards Ontario Drive, the layout requires a 50 meter Gasoline Alley to act as an artery to the pit lane. This Gasoline Alley makes the price of admission worth ever penny as you can get within plain sight to some to the competitors, cars, and crew members of the Indycar series before and after on-track periods. With no doubt, this area is an IndyCar fan's dream for getting a chance for a handshake, autograph, or a prized picture with their favourite driver. While drivers for the IndyCar series and the support race series are overall obliging to racing fans, drivers in the top level may leave a few fans disappointed at times. Ultimately a faultless development, whenever a high profile driver (ie. Helio Castroneves or Tony Kanaan) was has slowed down traveling between locations one photo opportunity or autograph would result in ten more fans would converge on that driver. For this reason, many drivers would commute either on the team's cart or on small scooters. Paul Tracy was one of few drivers to walk back to the paddock area following the first practice and I was a lucky man to have gotten his autograph. However, while I still enjoy the old gesture of the autograph, the digital world appears to make the photograph the new norm to providing a fan's connection to their favourite driver. The one and a half hour morning IndyCar practice went off with only a few cautions, one for a stalled Will Power car and two tire barrier impacts concerning rookies Raphael Matos and Mike Conway. While these cautions were setbacks for those drivers, Power and Matos actually finished 1st and 2nd on the practice time scoreboard. Also in this section, Paul Tracy placed 5th in the running while Alex Tagliani settled in 13th. The one driver who struggled severely in that first practice was crowd favourite Danica Patrick in her Andretti Green Racing car. During the practice, Tony Kanaan was seen chatting with her presumably for her benefit more than his. Approaching noon, I made the choice to briefly pull myself from the spectacle of the second Indy Lights practice to have lunch. There was still an afternoon of on-track action.